Saving lives at sea without losing your own, or the lives of your crew, requires skill, courage and committment. The Royal National Lifeboat Institution is an independent charity, and does not receive any funding from the UK government. 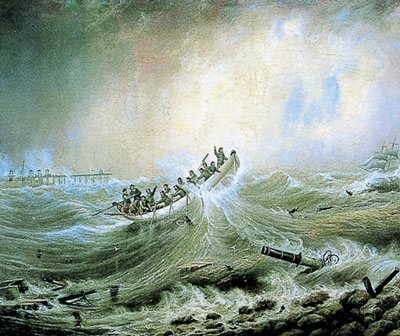 The RNLI has saved more than 137,000 lives since its foundation in 1824. Volunteers are the heart of the RNLI and they rely on more than 40,000 volunteers – on lifeboats, at lifeboat stations, on beaches, and in fundraising. For more details, contact the Westerham RNLI fundraising group by calling John Edwards on 01959 564063 or email him at grosvenor.house@hotmail.com. 2011: Film Whisky Galore! 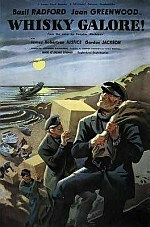 A 1949 Ealing comedy film based on the novel by Compton MacKenzie set on the island of Eriskay. It is based on the real-life 1941 shipwreck of the S.S. Politician and the unauthorized taking of its cargo of whisky. The plot deals with the attempts by Scottish islanders to take advantage of the unexpected windfall, despite opposition from British authorities. In the cast are Joan Greenwood as Peggy Macroon, Gordon Jackson as George Campbell, James Robertson Justice as Doctor Maclaren, A.E. Matthews as Colonel Linsey-Woolsey, and Compton Mackenzie himself as Captain Buncher. In 2006, the Westerham fundraising group organised a showing of Hitchcock’s film Lifeboat. 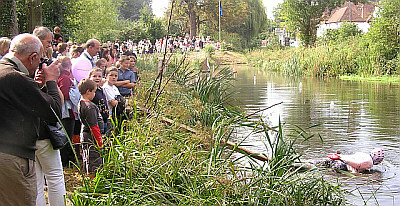 In 2007, we took part in the Rotary Fair on the Green and in September, there was a Gala Day at the Long Pond, involving the re-enactmentof the ducking of Hanny Saxby. In 2008 we held a Quiz at the Grasshopper and took part in the Day of Music on the Green. The main event was a walk along the Vanguard Way, in relays, from the Lifeboat station at Newhaven back to Westerham. In September 2009, we took part in the Fair at the Wolfe Weekend at Squerryes. In January 2010, a team from Westerham visited Denbies Vineyard near Dorking to take part in a Winter Welly Walk, organised by the RNLI.